Thanks to a very gracious table mate, I was able to purchase this lovely lady at the F.R. Convention this year. I love the high couture look of the Monogram line by Integrity and this lady fits in very well with my collection. I was also impressed with the promotional photos of the up and coming Monograms for the holidays so I thought I would play around with some more dramatic lighting. Here is my first attempt at trying to sculpt the light into something different. While it isn’t perfect yet, I am liking the direction it’s taking. This ladies jewelry is TO DIE FOR! This entry was posted on October 16, 2011 by raberry65. 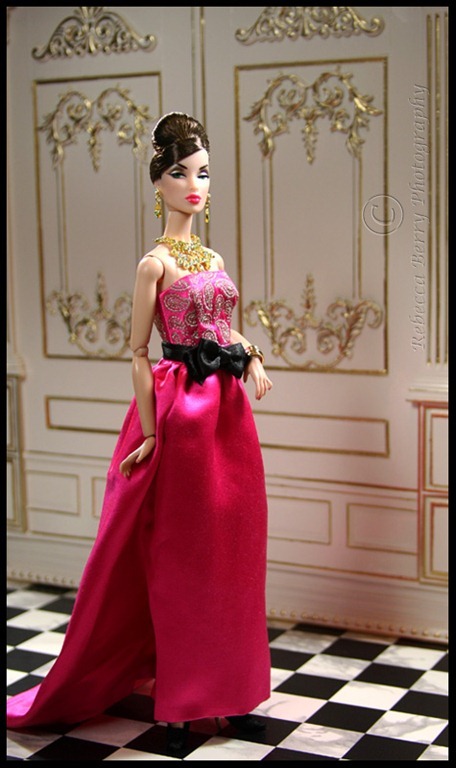 It was filed under 1/6 Wall panel, Fashion Royalty, Monogram and was tagged with 1/6 wall panel, 2011 Fashion Royalty Jet Set convention centerpiece doll, Beyond the Still Monogram, Centerpiece dolls, Doll Photography, Fashion Royalty Monogra. She does have tha attitude doesn’t she. 😉 Happy Birthday dearest Peter! She is fabulous just like your talent for display and photography!!! Awww! Thank you so much Judy! Our picture says she has attitude and she’s proud of it. Once again a fantastic picture. Thank you so much Ralph. This new Monogram face sculpt definitely has the attitude. She is one of my favorites from convention!